"Mind-blowing. You've never seen anything like it." 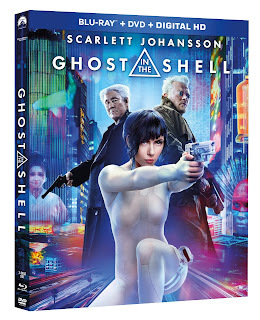 HOLLYWOOD, Calif. – "Totally riveting" (Bill Zwecker, FOX-TV) and filled with "heart pounding excitement" (Pete Hammond, Deadline), the thrilling and eye-popping GHOST IN THE SHELL arrives on 4K Ultra HD Combo Pack, Blu-ray 3D Combo Pack, Blu-ray Combo Pack, DVD and On Demand July 25, 2017 from Paramount Home Media Distribution. The future comes early on Digital HD July 7. Set in a world where people are enhanced with technology, GHOST IN THE SHELL follows Major (Scarlett Johansson), who believes she was rescued from near death. The first of her kind, Major is a human mind inside an artificial body designed to fight the war against cyber-crime. While investigating a dangerous criminal, Major makes a shocking discovery – the corporation that created her lied about her past life in order to control her. Unsure what to believe, Major will stop at nothing to unravel the mystery of her true identity and exact revenge against the corporation she was built to serve. A "visually stunning"
(Leah Greenblatt, Entertainment Weekly) "classic in the making" (Dan Casey, Nerdist), GHOST IN THE SHELL also stars Takeshi Kitano, Michael Carmen Pitt, Pilou Asbæk, Chin Han, and Juliette Binoche. 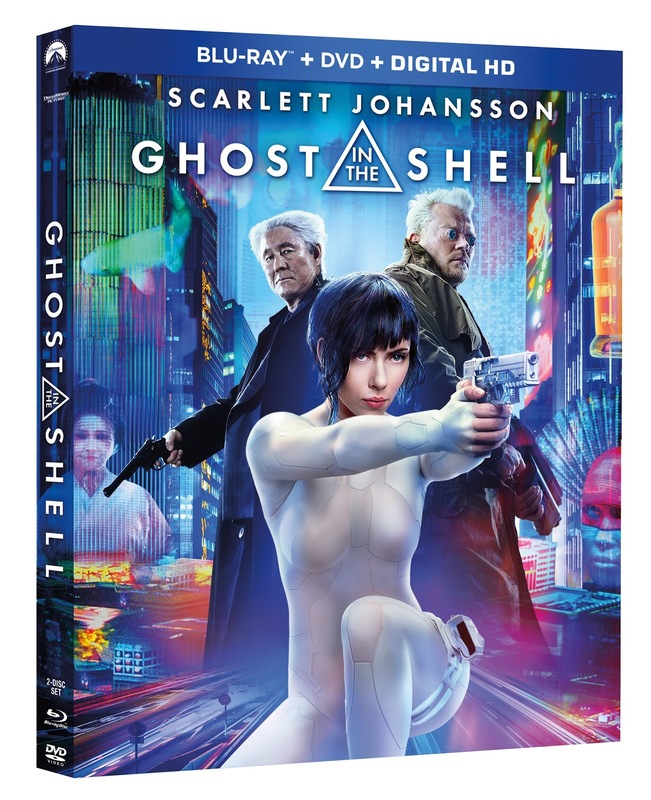 The GHOST IN THE SHELL 4K Ultra HD, Blu-ray 3D and Blu-ray Combo Packs are loaded with over 50 minutes of fascinating special features. Scarlett Johansson, director Rupert Sanders and other cast and crew take you behind-the-scenes to talk stunts, special effects and intricate fight sequences. Plus, take an in-depth look at the real-life science behind robotics; discover how cyber-enhancements give each character specialized super–soldier abilities; and learn about the original anime as well as the inspirations behind the visually stunning view of the future. The film also boasts a Dolby Atmos® soundtrack* remixed specifically for the home theater environment to place and move audio anywhere in the room, including overhead. The Blu-ray 3D Combo Pack includes a Blu-ray 3D presented in 1080p high definition with English Dolby Atmos (Dolby TrueHD compatible), Parisian French 5.1 Dolby Digital, Castilian Spanish 5.1 Dolby Digital, German 5.1 Dolby Digital, Italian 5.1 Dolby Digital, Japanese 5.1 Dolby Digital and English Audio Description, along with English (UK), English (UK SDH) Bahasa Malaysian, Brazilian Portuguese, Cantonese, Castilian Spanish, Czech, Danish, Dutch, European Portuguese, Finnish, Parisian French, German, Greek, Hebrew, Hungarian, Icelandic, Italian, Japanese, Korean, Latin American Spanish, Mandarin Simplified, Mandarin Traditional, Norwegian, Romanian, Slovakian, Swedish, Thai, Turkish, and Ukrainian subtitles. The Blu-ray Disc™ in the combo pack is presented in 1080p high definition with English Dolby Atmos (Dolby TrueHD compatible), Canadian French 5.1 Dolby Digital, Latin American Spanish 5.1 Dolby Digital, and English Audio Description and English, Canadian French, Latin American Spanish and Brazilian Portuguese subtitles. The Blu-ray includes the same content listed above and the Combo Pack also includes access to a Digital HD copy of the film. Paramount Pictures, DreamWorks Pictures and Reliance Entertainment present an Arad Productions/a Steven Paul production, a Rupert Sanders film: Scarlett Johansson "Ghost in the Shell." "Beat" Takeshi Kitano, Michael Carmen Pitt, Pilou Asbæk, Chin Han, and Juliette Binoche. Music by Clint Mansell and Lorne Balfe. Costume designers Kurt and Bart. Editors Neil Smith and Billy Rich. Production designer Jan Roelfs. Director of photography Jess Hall, BSC. Executive producers Jeffrey Silver, Tetsu Fujimura, Yoshinobu Noma and Mitsuhisa Ishikawa. Produced by Avi Arad, p.g.a., Ari Arad, p.g.a., Steven Paul and Michael Costigan. Based on the comic "The Ghost in the Shell" by Shirow Masamune, published in Japan by Kodansha Ltd. Screenplay by Jamie Moss and William Wheeler and Ehren Kruger. Directed by Rupert Sanders.